BTS256-EF – mobile light meter for photopic and scotopic illuminance, EVE factor, luminous color, color rendering index, luminous spectrum and flicker. The BTS256-EF is a high-quality light meter that is well suited for illuminance and luminous color measurements in all application areas thanks to its compact design, high-quality light sensor and precise cosine field of view function. 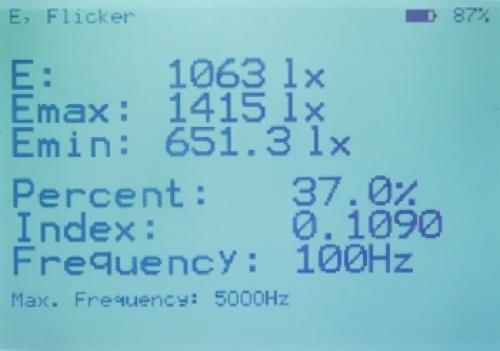 Another special feature of the device is its ability to perform flicker measurements. The BTS256-EF is a high-quality light meter that is well suited for illuminance and luminous color measurements in all application areas thanks to its compact design, high-quality light sensor and precise cosine field of view function. One of the outstanding properties of this mobile light meter is its BiTec light sensor. This combines the characteristic properties of a silicon photodiode with those of a low-noise CMOS diode array. The BiTec sensor guarantees precise photometric and spectral-radiometric measurement values over a large dynamic range through mutual correction of the measurement signals of both sensors. When taking into account the dynamic range, linearity and speed, silicon photodiodes have always been and are still the ultimate light detectors. 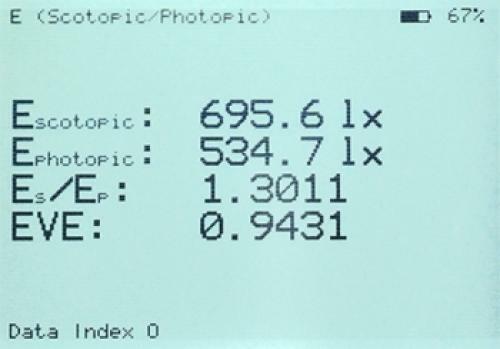 A photometric corrected silicon photodiode is therefore incorporated in the BiTec light sensor of the BTS256-EF light meter. Its matching to the photometric V(λ) responsivity is improved by the diode array’s spectral measurement data. 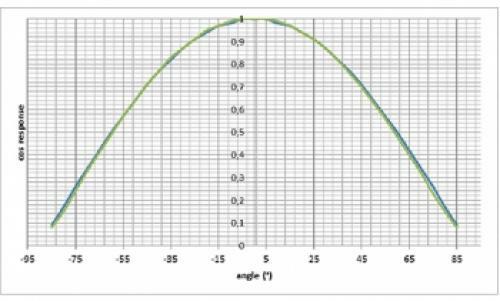 Flicker measurement entails identification of a possible AC component of the light signal with a 5kHz bandwidth. 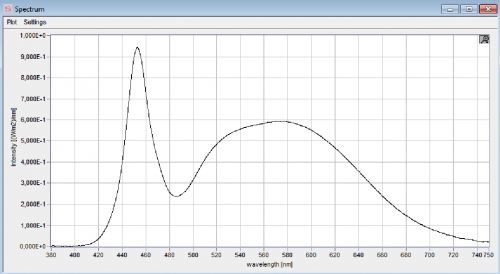 Besides the flicker frequency, other flicker parameters i.e. Flicker percent and flicker index are also displayed. 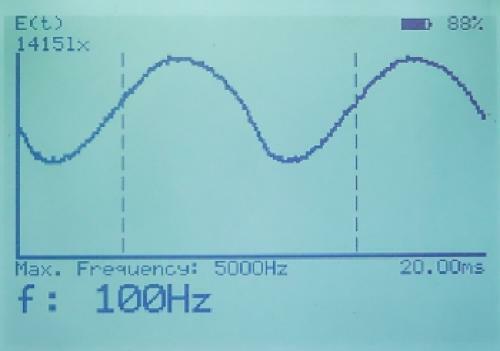 The device additionally performs a Fast Fourier Transformation so as to display other frequency components in the signal. For more details, see the technical article on flicker. The CMOS diode array of the BiTec Light sensor provides precise measurement data required for the luminous spectrum. 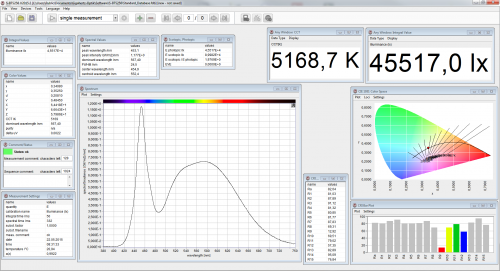 This data is then used for calculation of the color values and scotopic illuminance as well as for optimization of the photometric responsivity. The noise signal from diode array detectors has significant effect on the signal to noise ratio (SNR) and hence on the quality of the measurement signal as well. A remote controlled shutter in the BiTec light sensor enables online compensation of the dark signals that are dependent on the temperature and integration time. The fast photodiode of the BiTec light sensor enables the BTS256-EF to automatically synchronize itself to the frequency of lamps operated in PWM mode. A cosine corrected field of view is absolutely necessary for illuminance measurement devices. For extended illuminance setups, the cosine matching has significant influence on the measurement uncertainty of the light meter. The BTS256-EF light meter is equipped with a diffuser window with a 20mm diameter whose cosine matching ensures an f2 ≤ 3% uncertainty which corresponds to the DIN 5036 requirements for the quality class B. Both detectors of the BiTec light sensor are centrally aligned behind the diffuser window and therefore have the same view angle. Through the cutting-edge Bi-Technology sensor concept, use of modern electronics, online dark signal adjustment and the possibility to perform temperature compensation, the device meets the conditions specified for two of the DIN 5036 quality classes. In terms of the f2 uncertainty i.e. 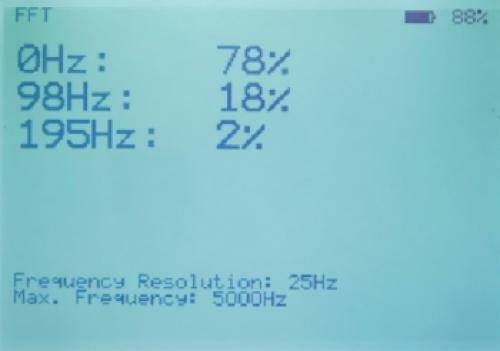 ≤ 3%, the device corresponds to the quality class B (DIN 5032 section 7). In applications where limitation of the viewing angle is acceptable, the BTS256-EF, with its f1’, u, f3 and f4 values, corresponds to the quality class A (DIN 5032 section 7). 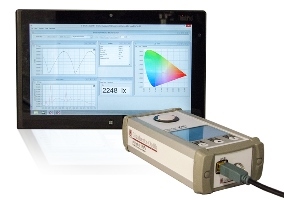 The BTS256-EF Bi-Tec sensor luxmeter has several display modes where the necessary measurands for the common photometric measurements are incorporated. The cursor buttons can be used to switch between the displays. The BTS256-EF enables users to individually configure and save display modes. The required measurands can hereby be selected. An incorporated Info Display shows all the relevant measurement parameters. Three control buttons and the diligently structured menu navigation make the device easy and safe to operate the device. For instance, in the standard measurement mode, the user does not have to manually set the measurement parameters since these are automatically and best adjusted to match the measurement conditions. In the expert mode, the user has access to all measurement parameters. If the user wants to distance himself from the device’s field of view, he/she can set a time-delayed measurement. 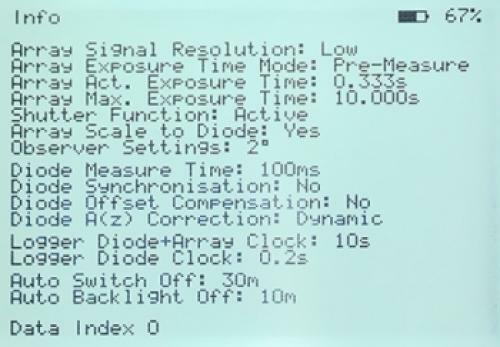 The display can automatically be dimmed during the measurement. An acoustic signal can be set to mark the end of a measurement. A layout created using a PC with the support points for the single measurements can be adopted in the device for measurement of the illuminance distribution. The measurement points can be progressively processed and saved. Fast data logger measurement mode where time-clocked readings of the photodiode can be recorded at a maximum measurement rate of up to 100ms. A second data logger measurement mode that enables time-clocked recording of all measurands including the spectral measurement data. Date and time in real-time can also be set. The measurement device has a tripod stand socket on the bottom side. The protective cap for the diffuser window is attached onto the device. With this option the device can be controlled by the S-BTS256 per WiFi. The BTS256-EF has all the necessary functions enabling free operation of the device without having to depend on a computer. Furthermore, the rechargeable batteries have a capacity of more than 8 operation hours. The USB power adapter enables recharging of the device without a PC. The BTS256-EF additionally has a USB 2.0 interface for use with a PC. This enables both data exchange and battery charging. Gigahertz-Optik offers programmers the S-SDK-BTS256 Software Development Tool. This can be used with LabView from National Instruments, .NET from Microsoft and C/C++. The SDKs simplify integration of the BTS256-E in an internally developed software.